The hyper Content & Digital Asset Management Server automates and accelerates communication, marketing, and sales processes. Helping you to reduce costs and to achieve greater flexibility in day-to-day operations. Work for hyper Content & Digital Asset Management Server? "I enjoy working with it"
Automatic notifications, so I don't need to monitor the work on all assets of my projects. Access from everywhere, including my smartphone when I am on the road and need a certain document. Super fast Support. I didn't need it very often, but every time I had a question I got a quick answer. Since I am using my smartphone to mainly download assets, the functionality of the mobile client could be reduced. It seems to me that you have all the feature as well. Which is great, but I just don't like working on a small screen. It's great to simply access all my digitals work from everywhere. No matter if I am at work or on the road. I find the Annotation feature very useful. This enables to simply draw all my remarks directly on Images or documents without the need to describe all my change requests in detail using text. It's nice to know if the recpients of assets were accessing them and also receiving notifications each time an assets of mine has been changed. So I always stay up-to-date without Monitoring the work on assets on my own. Really nice feature that takes work load for montoring the progress from me. "Great tool for managing all digital assets"
I enjoy the user Interface, which reminds my of a desktop client I am used to. In fact it's browser based. Hard to believe when I first saw it. It support all mobile devices as well. Since I switched from IPhone to Android, nothing changed and I still got access to my folders. I can convert all videos with the desired settings in a single step. I simply select the videos I need to render, select the options once and let the system do the rest of the work. Not sure, I am quite happy with it. But I also have only seen a few DAM systems so far. HyperCMS offered the most advanced features and was far less complicated to use. I am a daily user, since we save all our files and work in the system. I find it easy to use and like that I have access to my files from everywhere. Sometimes I use the video editing to batch process all my videos in one step. It really helps me/us getting our work done. I especially prepare a lot of presentations (mostly powerwpoint) for different customers. The team members can use annotations to mark any change requirements and the workflows send the final version automatically to my my boss. So I don't even need to send an e-mail anymore to collect information and get my work approved. Best of all, no more e-mails with the differnt versions of files attached to it. I save a lot of time thanks to the DAM and I am quite happy, so there is nothing negative to report. It is a very good product for managing all your digital assets. If you edit files frequently you might want to take a look at the workplace integartion. Managing all my documents, images and videos for my presentations. Collaborating with team members and using the workflow. It really was a strugle to keep track of the work progess without the system. The flexibility, library stack and overall a friendly yet professionally responsible team. 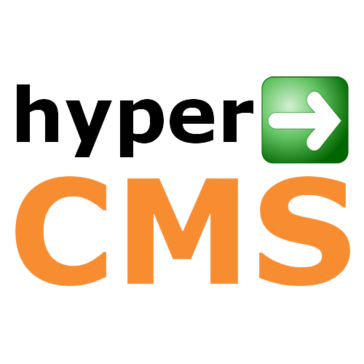 The hyperCMS has been built on the best available stable open source stack and thats commedable. Their sales and support team are there when you need them. They always work had and accept new suggestions for the solution to enrich it. hyperCMS provides the best value for money. The menu items are sometimes confusing as a lot of customizations are avaiable. I wish some advanced options could be rouped under some common menu items. Also, it would have been easier to search and display if there was a dedicated serach page (with optionional advanced options) so that seaching could be handled from one section and also showing google like results would have made the general users feel easy. Managing lots and lots of media asset is much easier with the system. Time consumption for searching and manging files has been decreased and productivity has increased. "Makes me work so much easier"
I like the fact, that the tool is easy to use. A colleague introduced my to the system, so I never had a training. You only need to get used to all the features available in the toolbar of the system. The system is very powerful, I hardly ever used all the functions. To me, the search, copy & paste, cut & paste, statistics, sending & sharing are especially useful and I use them quite often. I am not a very technical person, so I am happy with the overal experience. Nothing to complain about. I strongly recommend it, if you need a tool to manage all your files in your company. It is espacially useful for collaboration. You can comment, share and track your assets. Managing all videos, images, documents and news streams. Collaborating and sharting assets with our partners, sales, customers and internal teams. "Probably the best Open Source DAM (as they claim)"
I love the user interface and the rich set of features. I don't need to collect data for my reports, the system simply offers me all reports that I need as a graph and also as a table what I import to Excel. I can safe my searches and can simply reuse them again. It is also great that I can define what data I want to see in the results and I am not stuck with a predefined definition. The system works like a charm, no downtime, fast and offers everything I need for my work. I am missing good integrations for digital signage applications. Great product, contact support@hypercms.net in case of any questions. They are very helpful. Managing all our digital assets and to provide a platform for you partners and agents to share and download product related materials. "Very good and flexible DAM solution"
I am not a typical user, so my views might be a different. I am mostly installing and configuring the system for customers. If you run a Linux server, the software will be setup in a few minutes. All standard configuration can be done suing the GUI. The system support multiple tenants/publications which is great since you can use the same system for different organizations. The software is 100% Open Source and free. I found the GUI pretty much self explaining. So I didn't really need the standard user manuals. I like the fact, that it is based on common GUI standards. I would not run it on Windows although it's possible. But the installation of all the additional software packages is a hustle. A great DAM/MAM solution that does everything you might need. Besides that you can use it as a CMS to manage your websites as well. Mainly managing all the digital assets and automating business processes for our customers. "Great Open Source DAM Solution"
This DAM system offers a rich set of features. It's easy to start with and can probably do everything you would expect from a DAM solution. I like the fact that it is available on any browser, mobile or desktop. But you can also access all your files easily from your local file manager. This way you can work with your files the way ure are used to. Best of all, the storage is expendable very easily. You can store millions of assets without slowing the system down. Their cloud service is great and if you decide to run the system on your own hardware, it is also possible. You can even store your assets in nearly any cloud storage, like AWS, Azure and others. This way you are very flexible and pay for what you use. So big thumbs up! The support is fast and friendly. Comparing the prices of other DAM cloud solutions, there is nothing to complain about. Try the cloud service first, it is very affordable. You can still setup your own infrastructure later. Managing and sharing all kinds of digital assets, mostly images, videos and documents. Planning and managing tasks in the team. hyperCMS is a great digital asset management solution for sharing projects and files with internal and external team members, and controlling the level of access each user is given. It is very easy to publish assets to all kind of social media networks and partner websites. Best of all I can control the access from the system and receive monthly access reports including a geo report as well. I find the system very easy to use and I can simple access all files using my standard windows file explorer. I also like that all assets can be presented in a tree structure that I desire. This way I can browse all files very fast. I also find the annotation feature for images and documents very useful, I can simply draw my remarks directly on images or documents. For videos there is the text track feature that support text remarks in videos. Although I can use the system on my smartphone as well, I would like the user interface to be less complex and easier to use. It would be nice to reduce the functionality on mobile devices compared to the rich browser client. I think most people will use the smartphone to quickly access files but they don't work with assets on their phones. Organizing and finding all kind of files. This includes images, documents, and videos in different formats. We needed to solve the problem of sharing and providing large files quickly to other members. After we have seen that there are more features that might be useful, we also started using the task and project management to keep track of the work. The implementation is pretty much turn-key. Setting up metadata schemas is very easy. I find their solution very flexible. I was impressed that you can also create assets, based on feeds, or pretty much any other resource. You can edit videos and images in bulk, this feature saved me alot of time. The system will warn you if you upload duplicate assets and it will also provide you with the location of the asset. It's flexibility might be a disadvantage, when you expect a simple DAM. Get in touch with the support, they are very helpful and know what they are doing. Managing all kind of digital assets, including the import of external news and RSS feed for a news archive. Learning about hyper Content & Digital Asset Management Server? * We monitor all hyper Content & Digital Asset Management Server reviews to prevent fraudulent reviews and keep review quality high. We do not post reviews by company employees or direct competitors. Validated reviews require the user to submit a screenshot of the product containing their user ID, in order to verify a user is an actual user of the product. Hi there! Are you looking to implement a solution like hyper?